Annie and the Fur Trappers is a St. Louis traditional jazz band which formed in 2016. 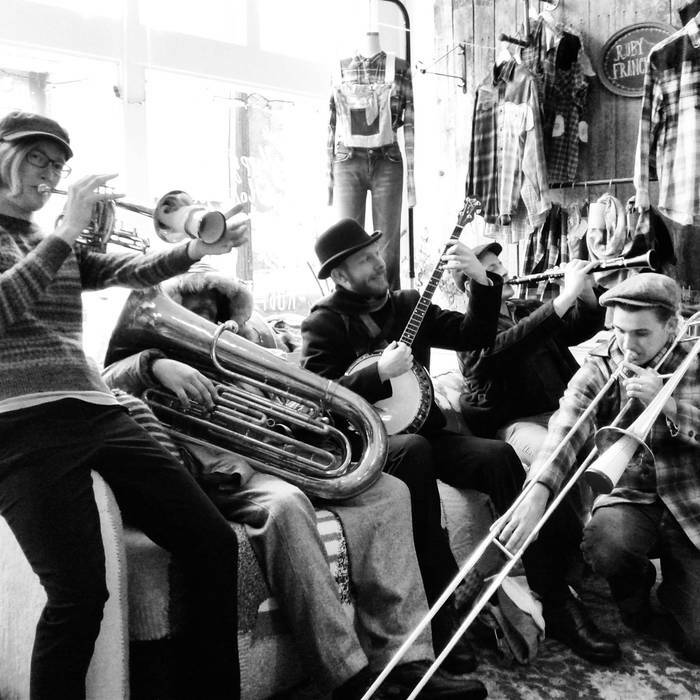 The band includes clarinet, trumpet, trombone, tuba, banjo, guitar, and washboard. Annie and the Fur Trappers is a St. Louis traditional jazz band which formed in 2016. The band includes clarinet, trumpet, trombone, tuba, banjo, guitar, washboard. Annie Linders, 27, is the eponymous leader behind Annie & The Fur Trappers. A trad jazz band, the Fur Trappers were born in a way that’s supremely fitting. As Linders recalls, she had some friends who were sailing down the Mississippi River. Thinking it sounded pretty fun, she invited herself along, and they agreed to pick her up along the way in St. Louis on the riverfront. “How will we find you?” they asked. She had an easy solution: She brought her trumpet. “They literally pulled up against the shore and picked me up as I was playing my trumpet,” she recalls. She ended up sailing with them for about a week, all the way down to Memphis. The band has been moving fast since its inception last year, including (already!) an album release, drawing on a large pool of players and seldom featuring the same ensemble twice. A teacher by trade, Linders has been working in urban and suburban school districts for several years and is currently teaching at Woodward Elementary School in south city. But her passion for music continues to find new outlets and take new forms. “I was inspired one night, going to Schlafly Bottleworks and seeing a trad jazz band from New Orleans called Tuba Skinny,” she says. Sitting in and playing with them, she says, made one thing clear: “Yes, I want to do this.” In no time, thanks in part to her friend TJ Muller, she had a full eight-piece band. One member of that pool of players is pianist Christopher Parrish. In addition to solo gigs, he’s found gigs with two St. Louis acts. The St. Louis Ticklers is one, a group so new it formed after Big Muddy’s booking concluded. The other is Annie & The Fur Trappers. It’s a comment that comes with this caveat, applicable not only to her music but the band as a whole: “People like it. And I like it. So I should do it some more.” And they’ll be doing “it” this weekend at the Big Muddy. While some folks may view the band as a bit of an outlier, Linders believes her act fits in just fine. She says, “Without the blues, the style of trad jazz would’ve never existed. The old-time blues and ragtime players in St. Louis and New Orleans created this music, and we do a lot of old blues numbers from the ’20s, so it’s not really that far off. “We can take a song by Blind Boy Fuller, where it’d normally be one person playing guitar and maybe with a washboard, and we just add all of our instruments to it and make it our own. Our playing the festival will break things up a little bit, bring a different shade of the blues, which I think is cool. “My dad really loved the blues,” she adds. “Growing up as a kid, he’d be playing BB King or Muddy Waters records around the house. The trad jazz stuff I didn’t really discover until a year, year and a half ago, seeing it around St. Louis. When I was taking music in middle and high school,we went more into the big band stuff, like Count Basie and Duke Ellington. The way I started playing the trumpet was through the blues; in middle school, the first time I improvised was on a blues number. INTERESTED IN BOOKING ANNIE AND THE FUR TRAPPERS?